Forty years after the application of Law 180, which sanctioned the closure of mental hospitals, a wide-ranging reflection on the revolutionary vision of Basaglia and the new psychiatric traps. Looking in perspective at the past four decades, Cipriano compiles an agile history of psychiatry to show the metamorphosis of the asylum device: starting from the mental hospital invented by Pinel in 1793, passing through the electric asylum (based on the electrochoc) and the chemical one (the current psychotropic drugs), and arriving to the next coming digital asylum, where the network will become the perfect Panoptic from which it is not possible to escape. With a narrative-essay style, Cipriano reconstructs the twenty-year fight against the mental concentration camp as it was conducted by Basaglia and the meaning of the resulting Law 180, wondering why a new anti-asylum revolution, a new 180, still appears as necessary. He then gives voice to the new mental health technicians and to the new patients, who are less and less patient and more and more demanding. And finally, he interrogates those who narrate mental care and patients to the general public, i.e. famous Italian directors, singers and storytellers like Paolo Virzì, Silvano Agosti, Nicola Lagioia, Pierpaolo Capovilla. 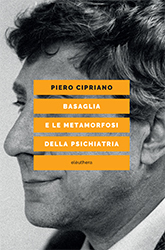 Piero Cipriano (1968) is a medical doctor, a psychiatrist, a psychotherapist, and an ethnopsychiatric. After workingin various mental health departments from Friuli to Campania, in the last few years he is working in Rome in a SPDC health centre.